It’s been one heck of a volatile start to the New Year with the oil market going berserk for what is coming up to nearly four weeks now. We’ve seen 10%-plus week-on-week declines to 5%-plus intraday gains for Brent and WTI. Plenty of predictions are around the market from extremely bearish to wildly optimistic. For instance, ratings agency Moody’s is assuming a drop to $33 per barrel for both Brent and WTI, while Citigroup calls oil the ‘trade of the year’ should you choose to stick with it. Doubtless, Moody’s errs on the side of caution, and Citigroup’s take is premised on the buying low, selling high slant. The Oilholic's prediction is somewhere in the mundane middle. On balance of probability, squaring oil supply and demand, yours truly sees Brent and WTI facing severe turbulence for the next six months, but very gradually limping up to $50 by the end of this year. That’s a $10 reduction on a prior end-2016 forecast. A detailed explanation is in the Oilholic’s latest Forbes column available here. In the event that surplus Iranian oil starts cancelling out production declines in North America and other non-OPEC production zones, there are several known unknowns. 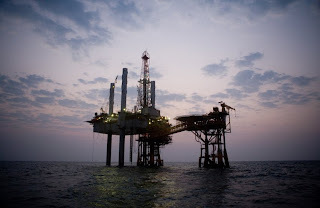 These include the strength of the dollar prolonging the commodities cycle and the copious amount of oil held in storage, the release (or otherwise) of which would have a heavy impact on the direction of the market. Nonetheless, $20 oil doesn’t sound all that implausible anymore even if it won’t stay there. Another key revision is the narrowing of the Brent-WTI spread to zero (twice over the course of last year), and a subsequent turn in WTI’s favour. From predicting a $5 premium in favour of Brent, the Oilholic is coming around to the conclusion that WTI would now have an equal, if not upper hand to Brent. The so-called premium in the global proxy benchmark’s favour was only established after a domestic US glut rendered the WTI unreflective of global market conditions back in 2008-09. Now that the global market is facing a glut of its own; oversupply sentiment is weighing on Brent too. Even if the WTI does not regain market prominence as many commentators are predicting, the US benchmark wont play second fiddle either. The usual caveats apply, and the Oilholic would be revisiting the subject over the second quarter. But that’s all for the moment folks! Keep reading, keep it ‘crude’! © Gaurav Sharma 2016. 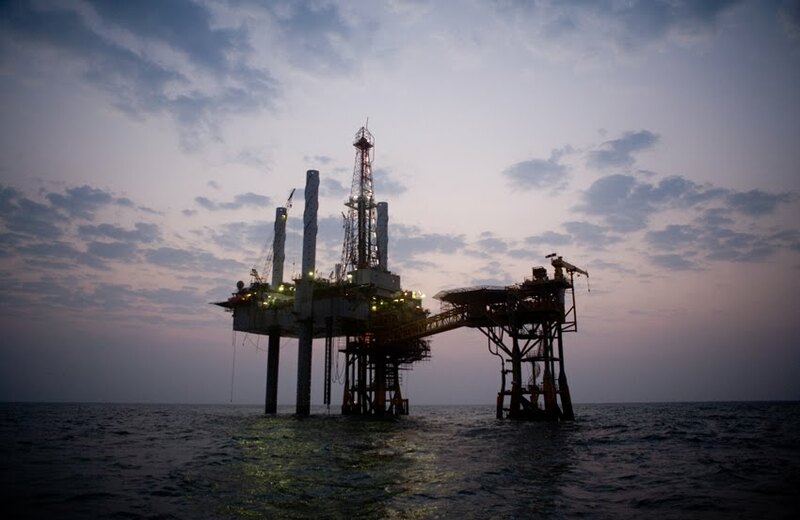 Photo: Oil rig in the North Sea © Cairn Energy. Successive bouts of over 10% week-on-week/five-day price declines have hit the oil market for six and made for a wretched start to 2016. Closing Brent price of that Friday itself was some 10.54% lower, WTI was down 10.48% lower and OPEC Basket Price down 10.94% versus the closing price of December 31. Suddenly, $20 per barrel oil doesn’t sound all that implausible! However, the Oilholic still maintains that while $20 oil is possible, it won’t stay there as an inevitable supply correction would kick-in. Excluding Gulf production, much of the world’s current oil production is barely being produced at cost, let alone at a marginal profit. 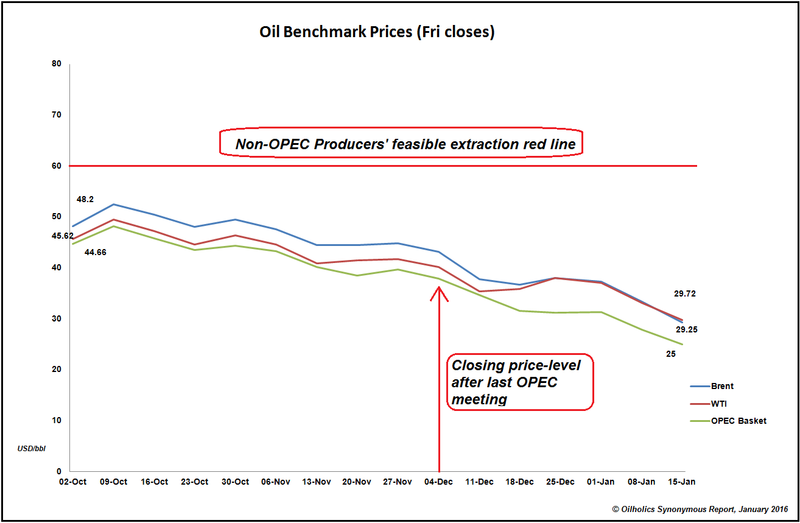 As non-OPEC producers’ hedges roll-off, the pain will hit home for we are a long way from the $60 comfort threshold for many. As for OPEC, even if the decline continues, the Oilholic feels there is little it can do other than to let the market take its own course. An OPEC cut would only keep rivals in the current game of survival called 'lower for longer'. That’s all for the moment folks! Keep reading, keep it ‘crude’! © Gaurav Sharma 2016. 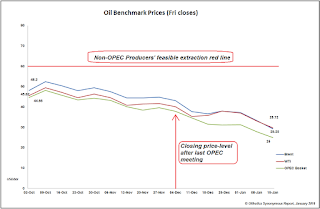 Graph: Oil benchmark prices (Friday closes) © Gaurav Sharma / Oilholics Synonymous Report, 2016.